Pictured above is a timing circuit for archery competitions. Outdoor archers shoot six arrows in one go and are allowed 4 minutes. Indoor archers shoot three arrows in one go and are allowed 2 minutes. The user can select one of two options – option 1 (outdoor) and option 2 (indoor) for either a two minute or four minute competition. 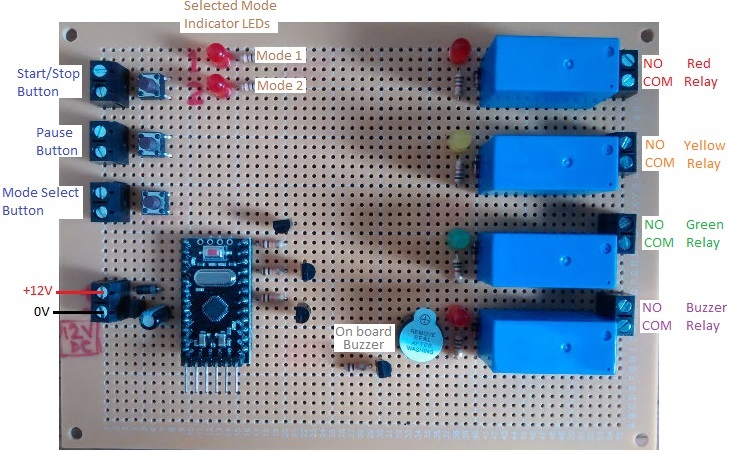 The controller board itself has a red, yellow, and green LED on it and a small buzzer. There are also four relays which can control larger lights – e.g. when the red LED is illuminates, a relay will be closed which can control multiple large red lights. The same is repeated for each LED and also for the buzzer relay which can control multiple buzzers or sirens. The Mode button is used to select the desired timing option. The red LED will be on while the controller is sleeping. When the Start/Stop button is pressed, the timer starts and the green LED turns on. With the outdoor timing option, the green LED stays on for 3 minutes and 30 seconds. With the indoor timing option, the green LED stays on for 1 minute and 30 seconds. Then the yellow LED turns on to give the archer notice that their time is running out. After 30 seconds the red LED turns back on again and the buzzer sounds briefly to indicate that time is up, and the device is reset ready for the next archer. While the timer is running, you can press the Start/Stop button to cancel the timer and reset the controller. Alternatively, you can press the Pause button to pause the competition. The buzzer sounds 3 times quickly to indicate that the competition has been paused and then when the Pause button is pressed again, the buzzer sounds 3 times. The timer continues from where it left off exactly after the buzzer sounds for the third time. If you need any kind of bespoke timer device, email neil@reuk.co.uk with details of your exact requirements.